What happened when the Roma came to Levenshulme? In Levenshulme, immigration is more than just a word. It is a policy that has shaped this part of south Manchester, close to the city's university district. 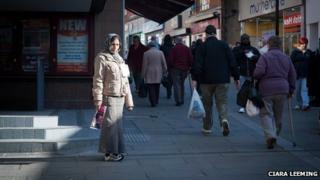 The High Street is dominated by independent colleges running courses in how to be British. Solicitors offer their services to help new immigrants stay in the UK. This is the place of choice for around 500 Roma people, mainly from Romania. Ramona Constantin is one of those who now regard Manchester as their home. When she arrived from Romania in 2009 she could not speak English and sold The Big Issue in the North to get by. Now, she helps others settle in the city, has won awards for her voluntary work and has met the Queen. She says she has been given a chance in this country, a place she regards as "my home, no matter what others say". Now a mother of three and a teaching assistant, she says: "I am super happy, because I have the opportunity to help other people, I have the opportunity to engage people in this community and also I feel part of the British nationality and the community of Manchester." Ramona is not alone. Several years ago there were only a handful of families in Levenshulme from Romania. Now there are around 2,000 Romanians in Greater Manchester. A lot has changed, but the change has been managed and unlike in Sheffield where senior politicians warned of serious unrest, there has been no similar talk here. Professor Yaron Matras, who leads the Romani project at the University of Manchester, worked alongside the city council, Greater Manchester Police, social business the Big Life Company and education officials to put a Roma Strategy in place. "We have been invited now by Sheffield and other cities to come and talk about our experiences," he said. "What we have done here anybody can do; there is nothing very special about us." There have been challenges at nearby Gorton Mount Primary Academy where nearly seven out of 10 pupils are from an immigrant background. In year five, only five out of 26 children are from a white British background. The school focuses its resources and the strategy appears to be working, says Carol Powell, the principal. Results from English and Maths are better than the national average. "We have improved our teaching of English as an additional language massively over the last seven years because we have had to, necessity being the mother of invention," she says. Although the school is a model of best practice, the speed of change in Levenshulme has left some who have lived in the area before the Roma arrived feeling uncomfortable. Tensions bubble to the surface at the local pound shop. One man, who is white, and has lived there most of his life, claims he feels as if he needs a passport in his own area. An Asian man blames the Roma for an increase in crime. A woman of Afro-Caribbean heritage said anybody who wanted to come to this country should "have a job before they leave, and not be allowed to claim benefits." The tensions are affecting young Roma people. Seven years ago, Daniel Moise arrived in the suburb when he was 12. He now works as a youth worker, building bridges and knocking down barriers. He feels the Roma are still misunderstood and children refuse to say they are Roma "because they are afraid they will get bullied", adding: "Most of us have a job. We are only looking to get paid to help our family." It is not clear now many more Romanians or Bulgarians will arrive from 1 January, but the lessons learned in this south Manchester suburb could apply across the country. Many say this part of Manchester has coped, but still some feel uneasy with the prospect of even more change to the place they call home.